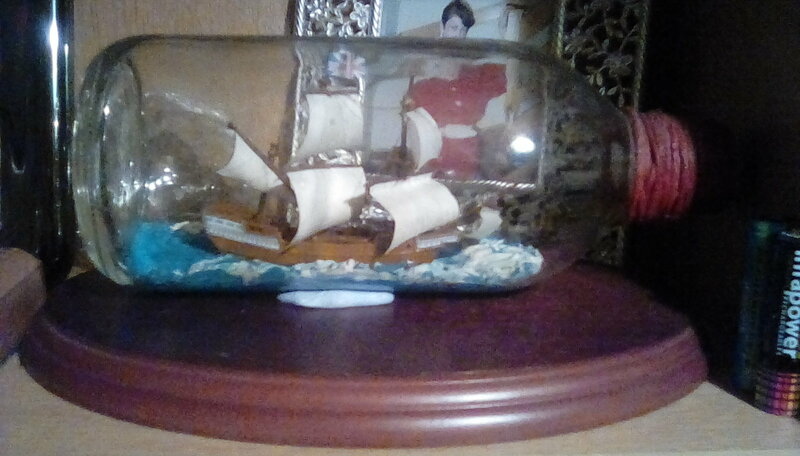 While serving in the military, I did once try and put a a ship in a bottle, this was a plastic 'man of war' in a glass bottle , I've still got it but it's not the same as putting something made from wood , paper and thread with my own hands into a bottle . I've never made anything from wood bar a fruit bowl I made at school many years ago but, with all the encouragement I've got from all of you maybe this will be something I can be proud of and say with pride " I made that" . I want to learn as much as I can from all of you . Maybe one day I'll put a Stalwart in a bottle , how? I've got no idea but how hard can it be ? That actually looks really good. There's no rules on medium. Use what ever you like. Paper is totally allowed. Wood is a lot of fun too. I think it's more forgiving than paper. My philosophy with wood has always been cut big then sand smaller. You can't sand paper down really. It shreds and folds. If you can build a paper ship in bottle I think you are very capable of building a wood one. I've never seen a plastic ship in a bottle. Was this a kit of some kind? I've recently purchased a selection of kits just to see what they are about. One is a paper everything with a glass bottle and cork. This is a travesty that should never be allowed to be perpetrated. Even the decorative seal, which should be cord, is paper. What a waste of a piece of glass. The next is a very nice kit by Airfix with a nice large rectangular bottle that was made in France but has a plastic ship model...Egads! My other two at least have wooden parts and one has an instruction manual that even a experienced builder could learn some tricks from. Ok, there are no rules. But I'd like to maintain the connection to the original modelers who only had limited materials and tools but had a lot of imagination and time on their hands. I'm sorry but, I can't remember who made them . This was back in the late 70s different but true it was plastic ship in a real glass bottle.